I’m not a fan of the traditional wedding guest book. 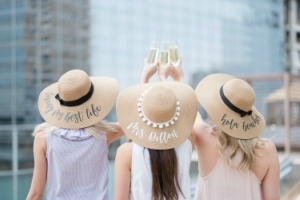 But then again, I’m not a fan of anything traditional, so I’m always psyched when I stumble upon unique destination wedding guest book alternative ideas. 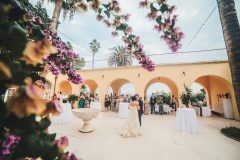 In this post, I’ve rounded up 22 really unique, interactive and travel themed guest book ideas to help inspire you. Not only will your guests have a blast with these interactive guest books, the best part is that you’ll have an awesome memento to proudly display in your home for years to come. 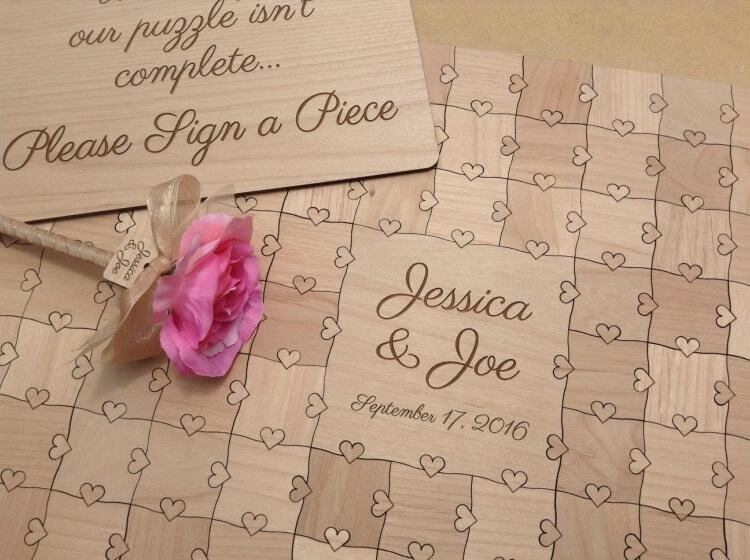 We’ve all seen the engagement photo with signature mat commonly used as a guest book alternative. 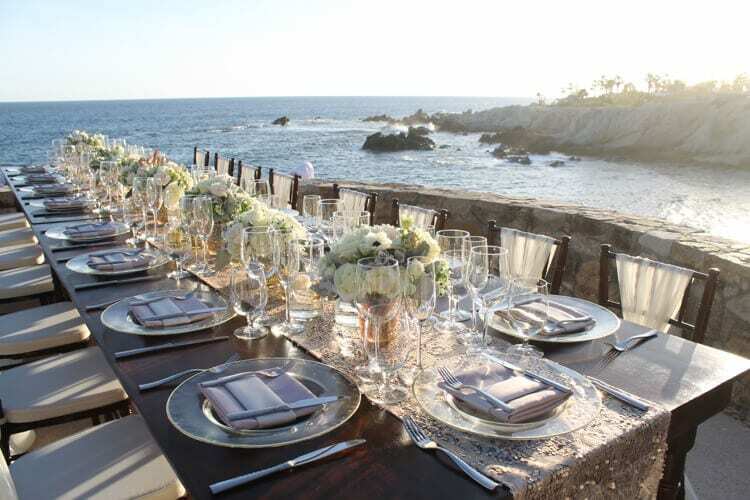 This is a unique twist on that idea that’s tailor-made for destination weddings. 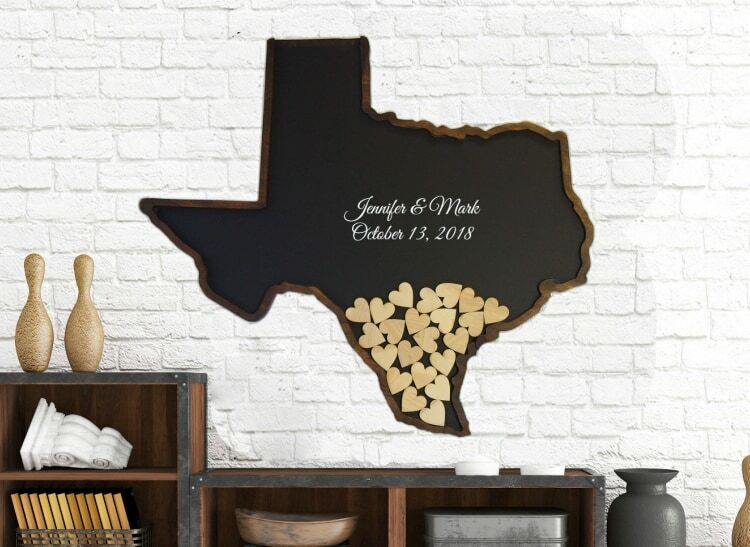 Your guests can sign the white space surrounding the map and you can hang this up in your home as a meaningful keepsake. 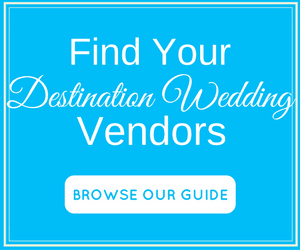 And with 72 watercolor options, you can customize the map to match your wedding colors. Are you and your boo from different regions? This is a great way to pay homage to your home state. 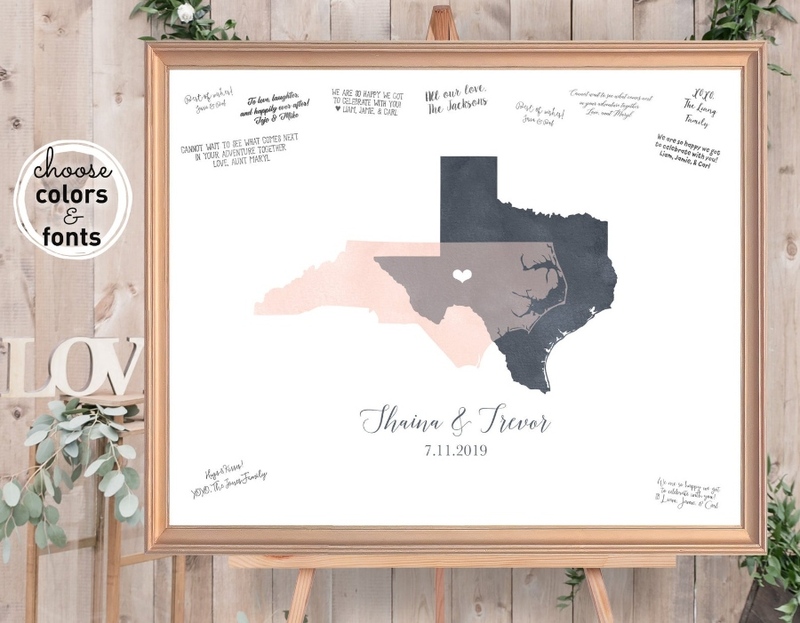 The artwork on this gorgeous destination wedding guest book alternative features maps of your home state overlapping and marked with a heart for each city. This canvas is such a meaningful piece of art. And it will only become more special when your guests fill the white space with their well-wishes. This is a similar idea to the one above but what makes this one stand out is that you’ll get the illusion of metallic foil –without the price tag. What you see here is a digital faux metallic image of overlapping maps. 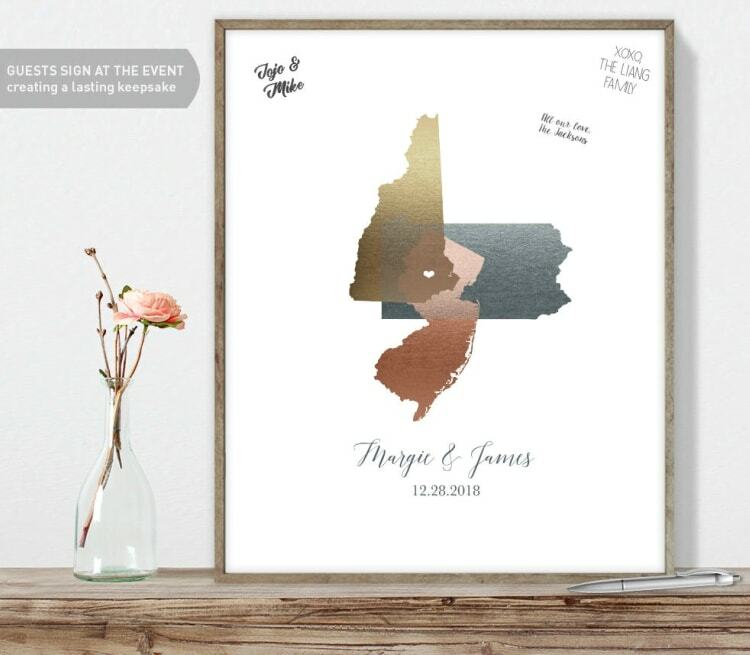 T This image shows the couple’s two home states overlapping with the wedding destination. You can choose any country or state for this stunning vintage piece of art. 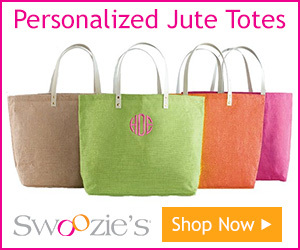 Plus, you’ll get to personalize it with your choice of color, icon, font, and text. I’m LOVING these super unique guest book alternatives. 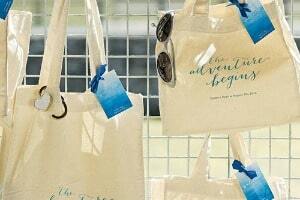 You can choose from 14 different color paper sheets, where your guests will write some marriage advice. Those sheets will then be rolled up and inserted into a beautiful wooden box which will be personalized with your names and wedding date. 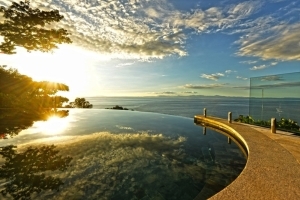 This is absolutely stunning, out of the ordinary and something you will want to proudly display in your home. Your guests mean the world to you. Some of them might even be traveling halfway across the world for your destination wedding. 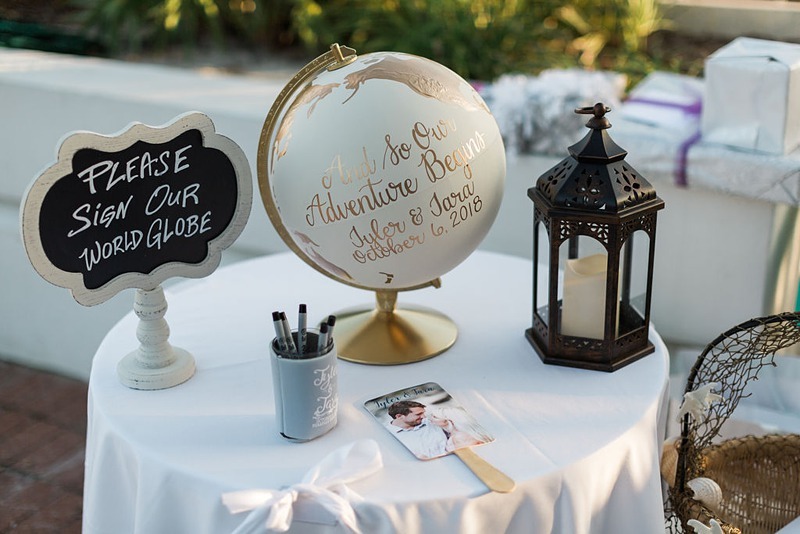 So can you think of a more appropriate destination wedding guest book alternative than a world globe? 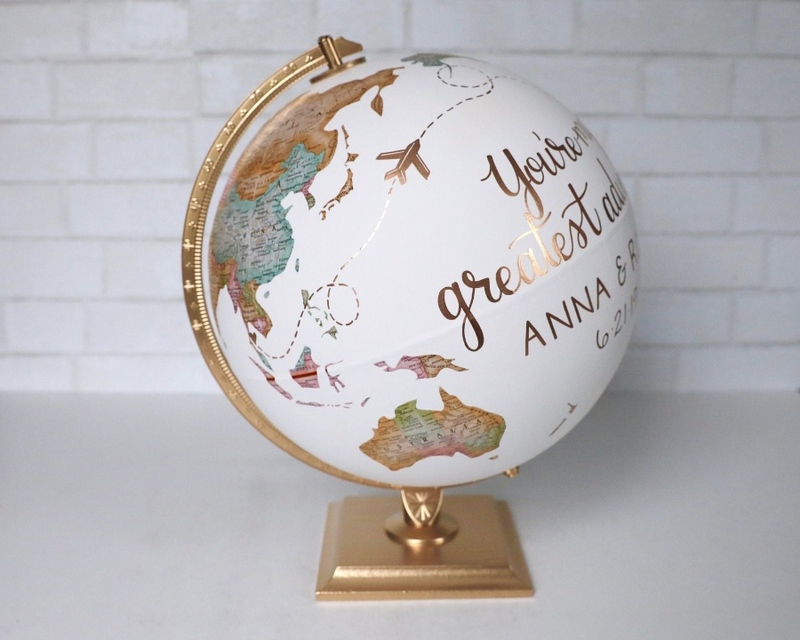 This upcycled plastic globe can be handpainted in your choice of colors and personalized with hand-lettered names, dates, and quotes! The ocean can be painted one color and the continents in another. There is also plenty of space for your guests to write on. I love, love, love this idea!! Dropbox alternative guest books have been a growing trend for a few years but this one is made for destination weddings. You can have your dropbox custom made in the shape of ANY country or state of your choice. 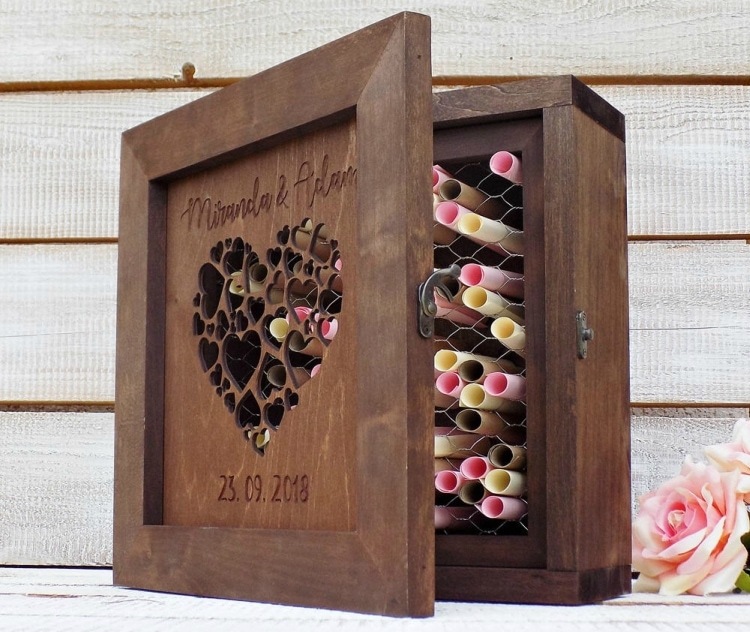 It comes with 150 wooden hearts which your guests can sign and drop in the box. The plexiglass on the outside will be personalized with your names and wedding date. How freakin’ amazing would this look on your wall?! 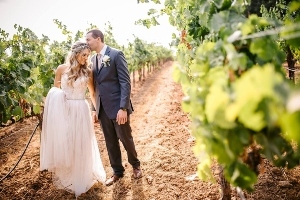 Rustic, chic, eco-friendly, travel-themed, and totally customizable – there’s so much to love about this destination wedding guest book alternative, I don’t even know where to begin. These tags are pretty awesome and easy to travel with. They are made from recycled card stock and hemp twine. 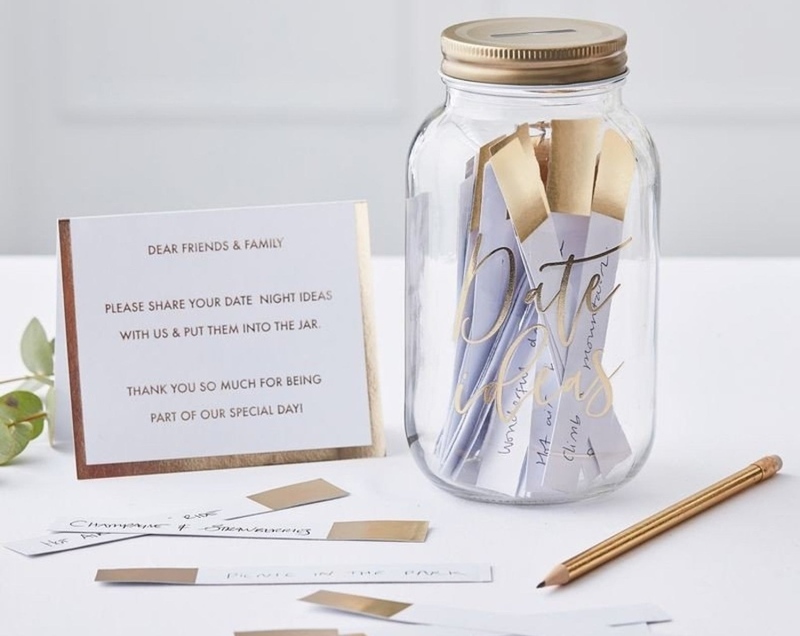 Your guests can write their well-wishes, and after the wedding, you can hang these on a wine bottle or even a vase as keepsakes. Love! 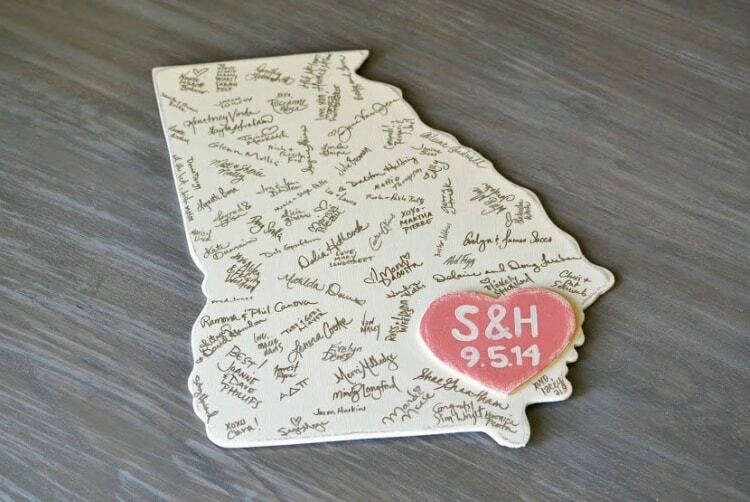 I’m kind of crushing on this guest book alternative because it’s just so perfect for a destination wedding. 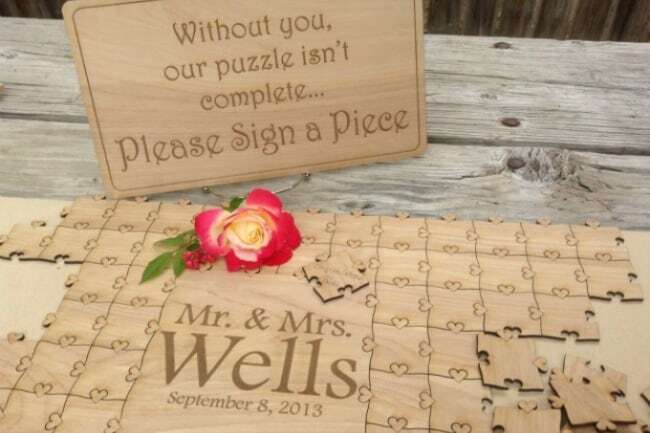 Your wedding country or state will be carved in wood and topped with a wooden heart in any color you want. After your guests sign their well-wishes, you can easily hang this up on your wall because it’s so lightweight. 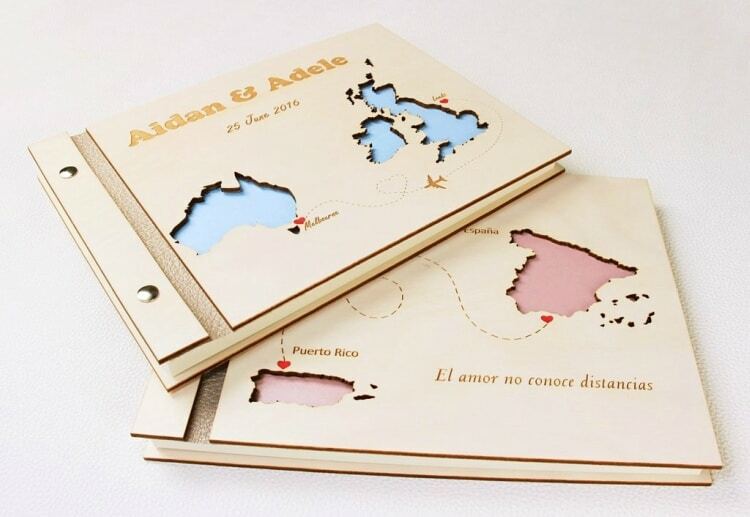 This super cool destination wedding guest book alternative is made of wood and is laser engraved with the maps of your choice! The front is completely custom so you can get really creative with it. 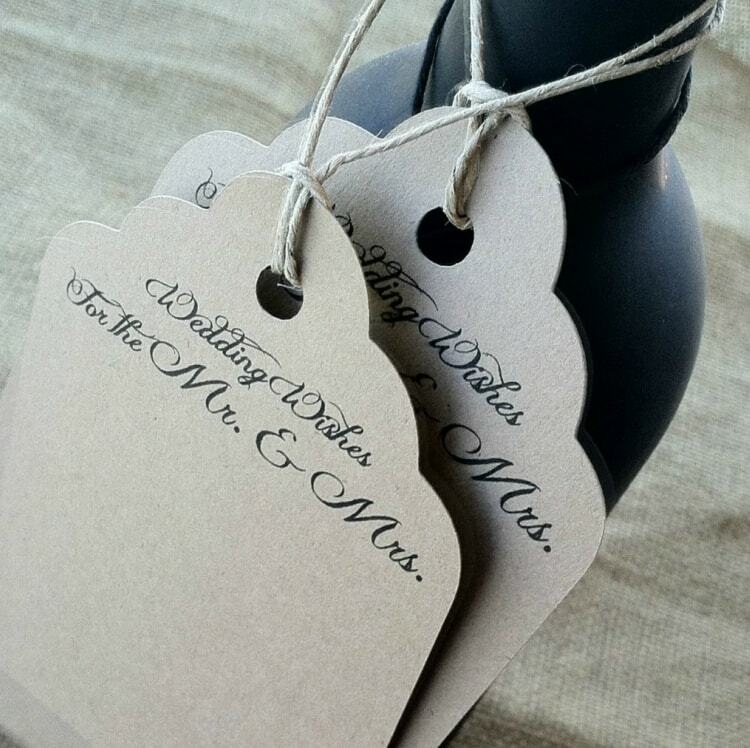 I love the example pictured here which was engraved with maps of where the couple lives and their wedding destination. 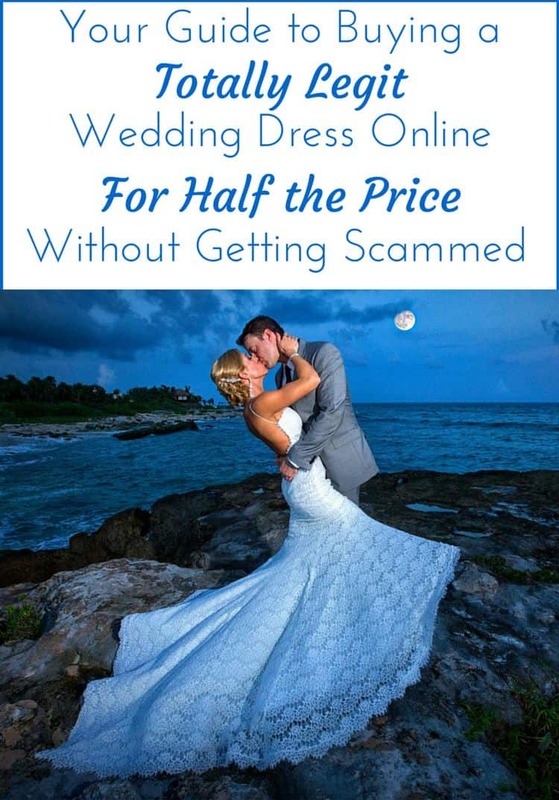 You can order this book with either 30 or 50 pages so it’s the perfect size for a small or medium size wedding. I’ve always thought that a Message in a bottle invitation is one of the most creative, fun and unexpected ideas for a destination wedding. 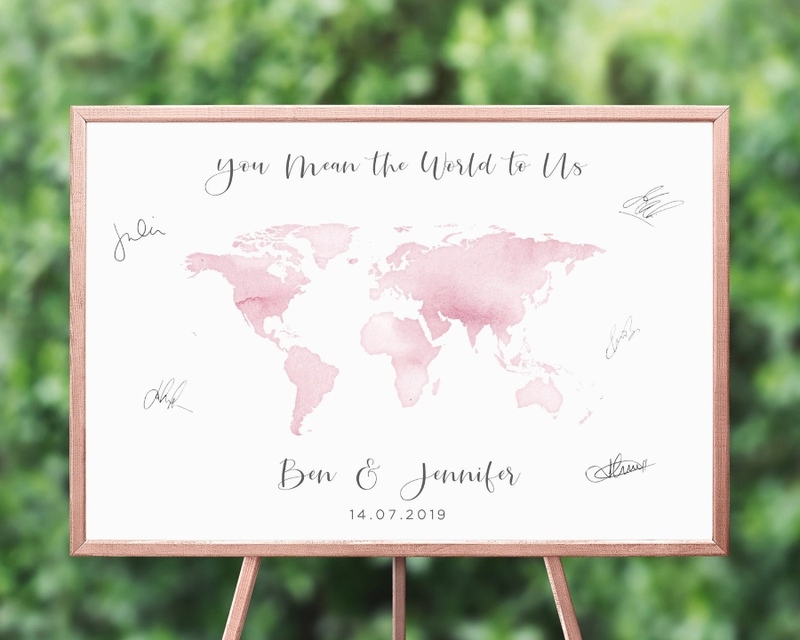 And when I saw this destination wedding guest book alternative I was blown away, because it’s the perfect way to tie into that theme at your reception in a subtle and classy way. And this isn’t just any ole’ message in a bottle. This fun keepsake comes with 5 bottles and a stand to hold them. 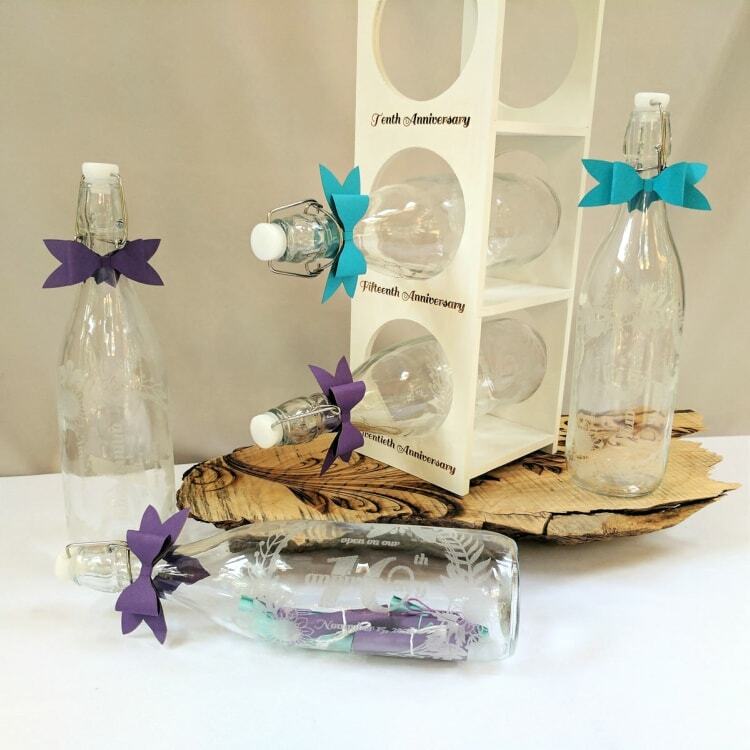 Each bottle corresponds to 5 different anniversaries so you can look back on the messages left by your guests on your wedding day. This is so unique and meaningful! 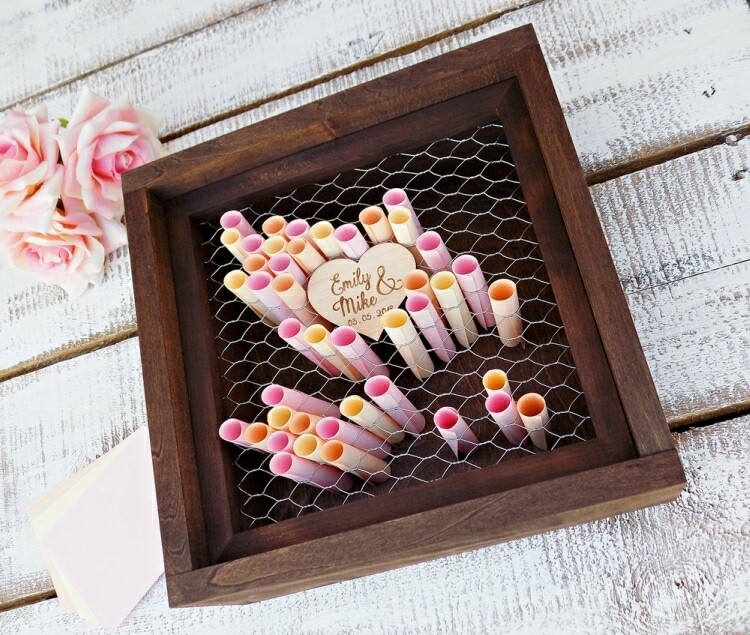 This is a pretty unique destination wedding guest book alternative idea. And I’m a fan. 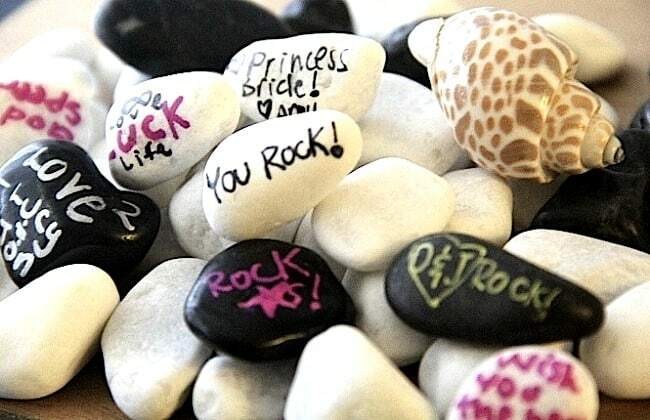 These even come with special paint pens in white or your wedding color. 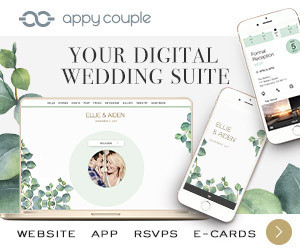 This is such a brilliant idea that I’m kind of upset I didn’t discover it when I was planning my own destination wedding. Your guests will have a blast jotting down some fun ideas for your future date nights and you’ll get to display this in your home to draw tons of inspiration for years to come. 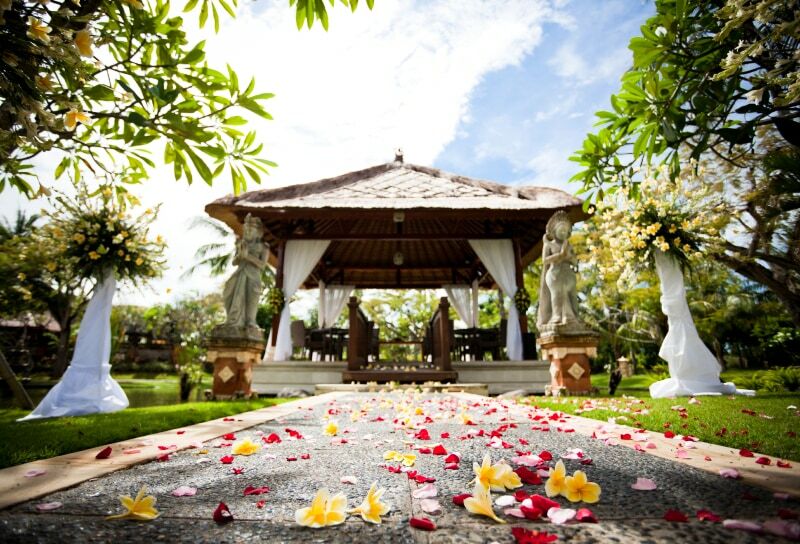 My heart melts anytime I see destination wedding details with a deeper meaning. 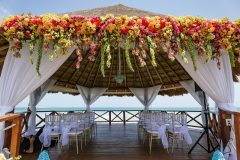 Destination Weddings are usually very intimate with just a few close family and friends who made a greater level of effort to be there. 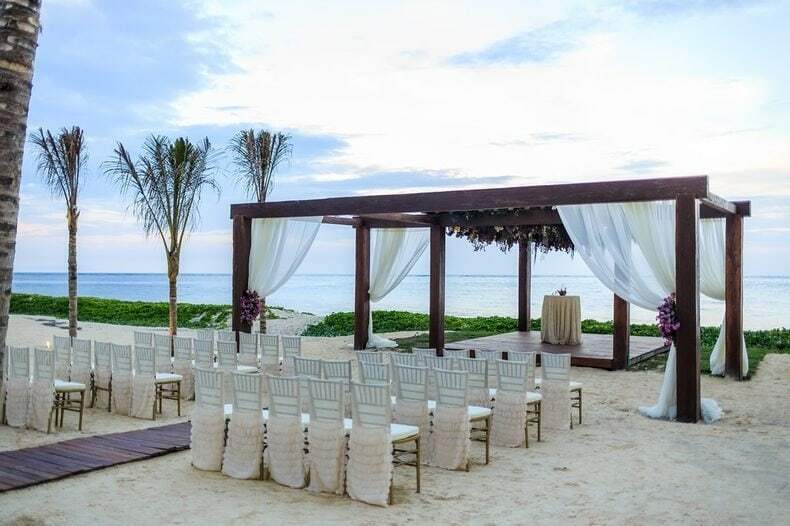 So while this might not be as appropriate for a traditional wedding with 400 guests (half of whom you might not even know well), it is absolutely perfect for a destination wedding. 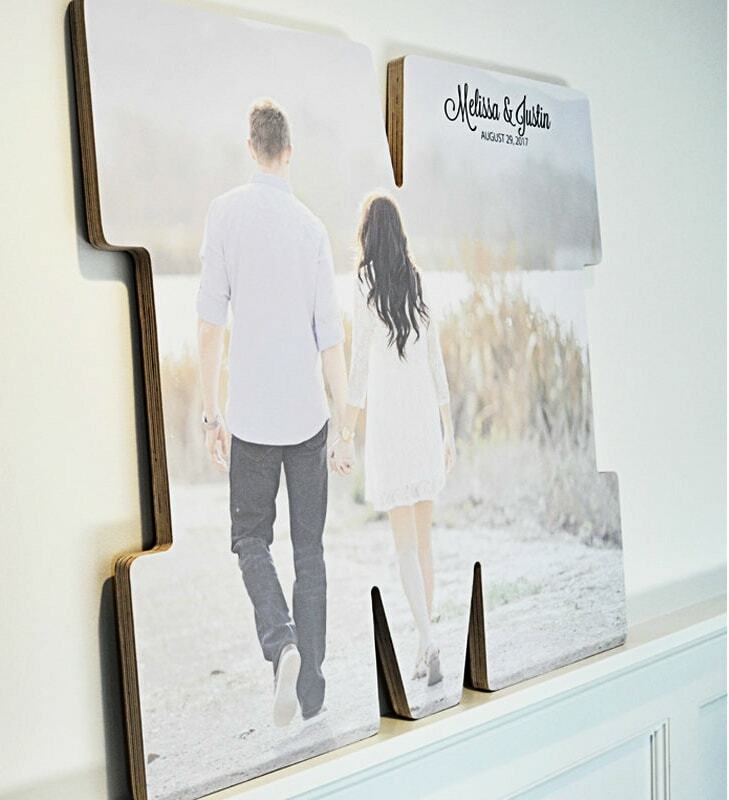 The puzzle has 100 pieces your guests can sign, and I think it would look awesome displayed in a shadow box frame on the wall. 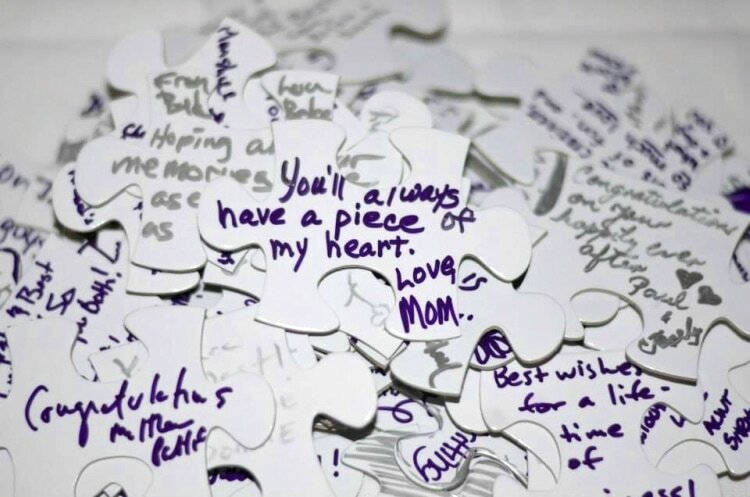 Here’s another awesome idea that might not work for a huge wedding but is just perfect for an intimate destination wedding because it comes with just 54 game pieces for your guests to sign. 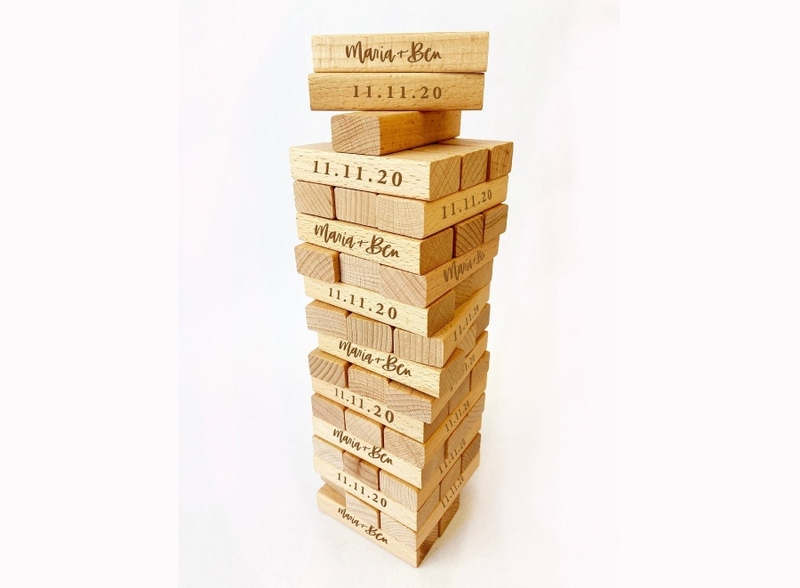 Each jenga piece is laser engraved and made of real wood. Another example of a meaningful guest book alternative that gets my instant approval is this 3D tree of life. Your guests can “leaf” their fingerprints, and also sign on top of it. 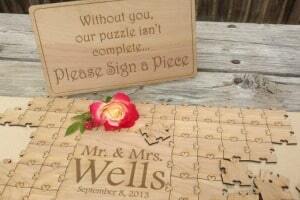 This is another cool and really customized guest book alternative. 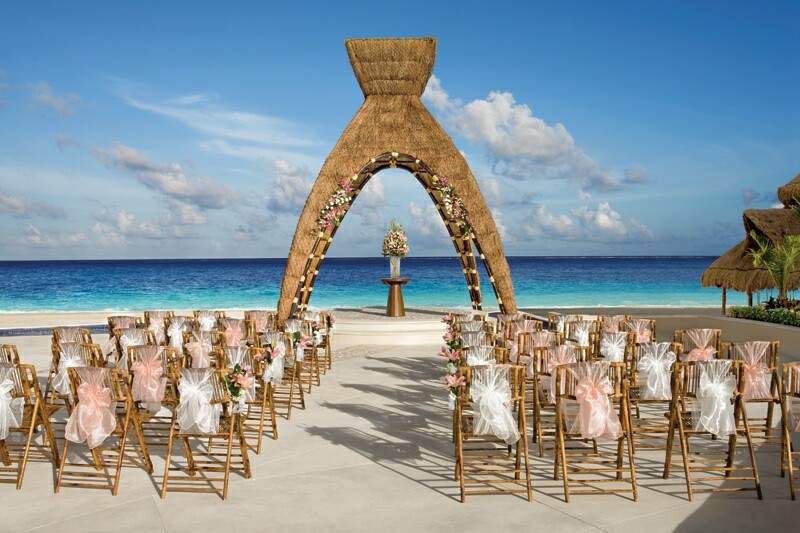 It’s perfect for the slightly larger destination weddings because it comes with your choice of 150 or 200 pieces. 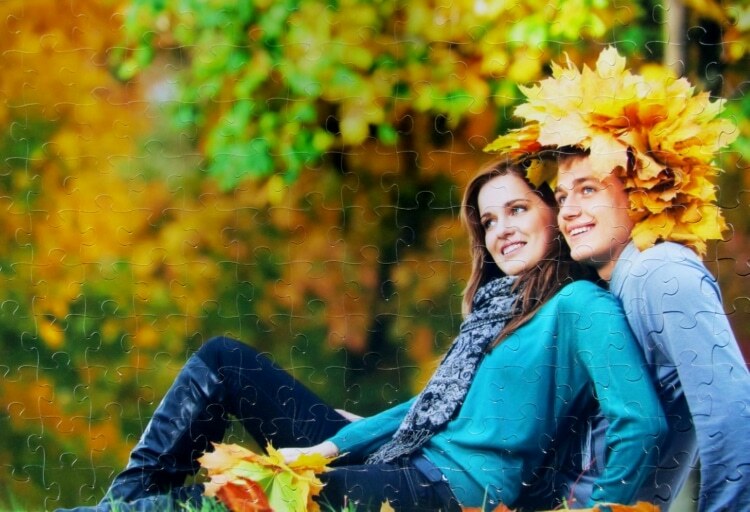 You can use any photo you want for the front (for example, an engagement pic) and your guests can sign the back of the puzzle pieces. 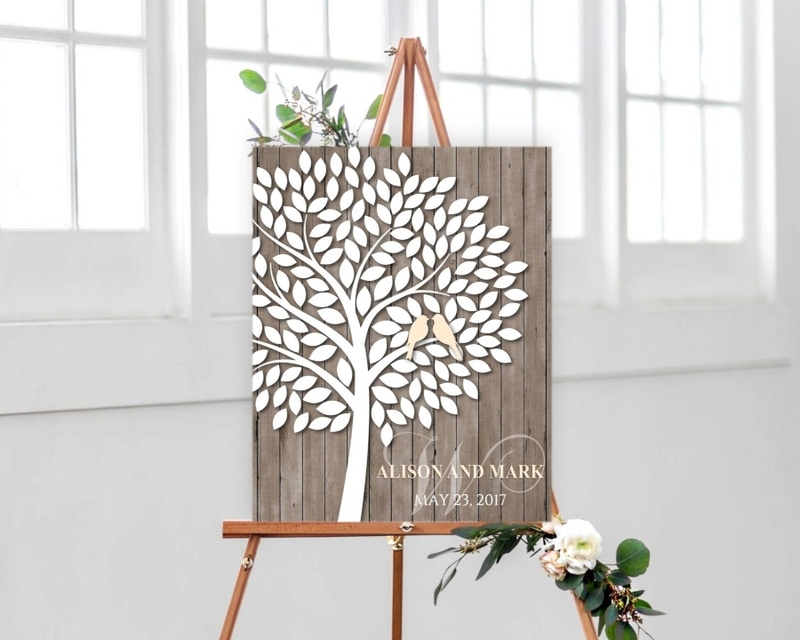 With a photo imprinted on a carved out wooden letter, this guest book alternative will be totally unique and totally you. It comes in two sizes and you can order it in a linen or luster finish. 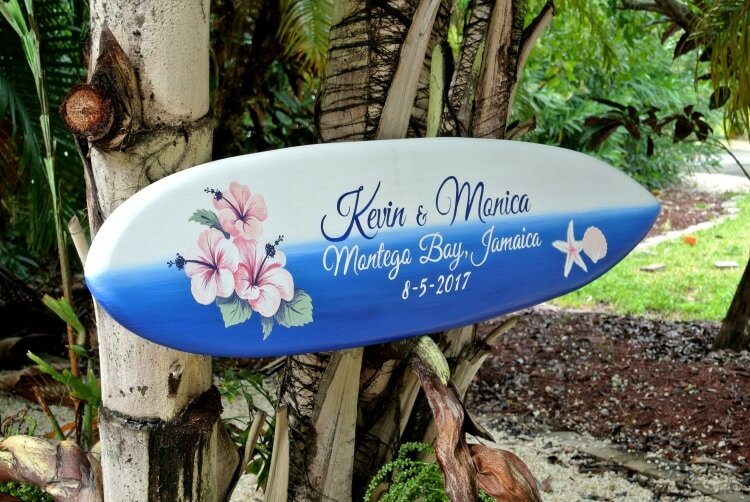 I’m really digging the unique, tropical but still elegant vibe of this destination wedding guest book alternative. You can get your surfboard hand painted with any color and design you want– plus it comes ready for hanging on the wall or on your porch. Ok, so this technically is a book, but I had to include it because it’s so fun and thematic. 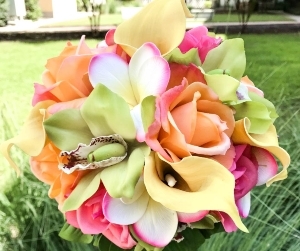 It comes in a variety of colors too so you can match it to your wedding colors. 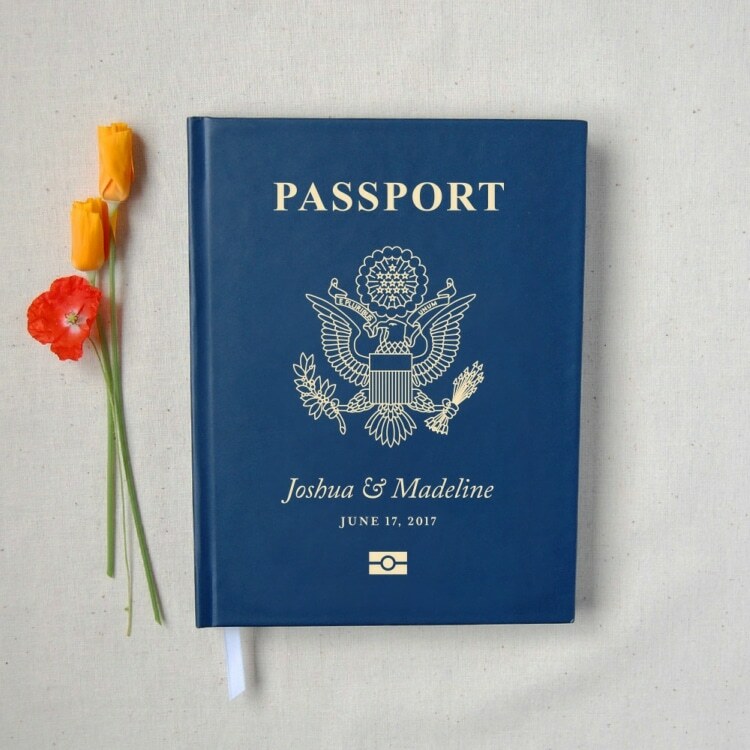 This would be pretty awesome paired with the passport invitations I featured in this post. 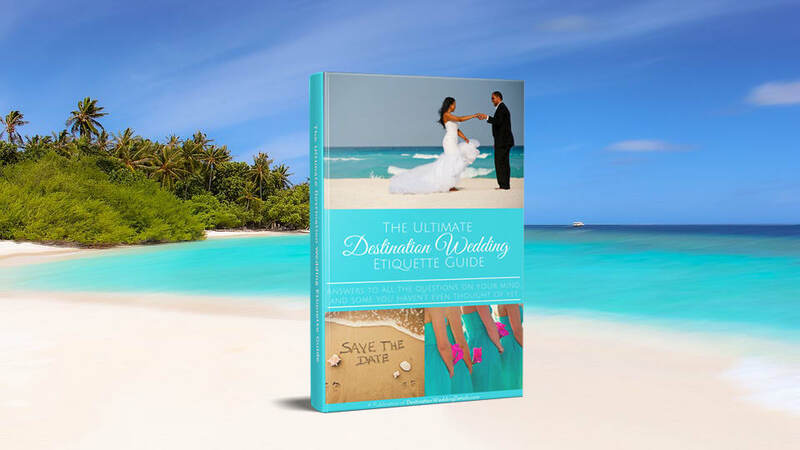 Do you want a totally unique and out of the box destination wedding guest book alternative that no one else will have? Something that is completely unique to YOUR destination?! Look no further, my friend. 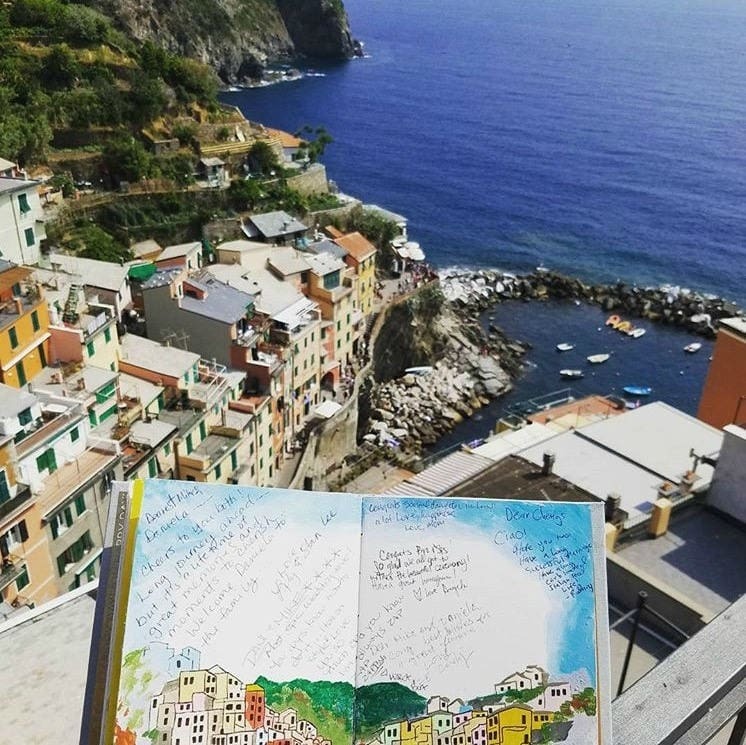 I am head over heels in love with this book which is hand painted with a landscape from your destination. The rest of the pages can also be decorated with your theme or something that represents the country. 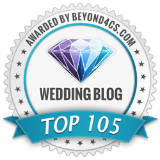 Hi Alicia – Just click on the photo credit (the link right below the image) and it will take you to the original source on Etsy where you can purchase it. Hi – I don’t sell those myself. They are sold on Etsy and if you click on the link right below the image you can see the price and even other options you can buy. Here’s the link again: Northern Owl Creations on Etsy. Hope this helps!